The shocking Friday 13th terror attacks reported from Paris last night penetrated our awareness only this evening (Saturday night) with the departure of the Sabbath. Before trying to make any sense of the events, here (for our benefit as much as for those following our blog) is a rundown on what happened, based on timelines published by FRANCE 24 and The Guardian. To start with what we know now, the bare numbers. 129 people were killed (as of late Saturday evening), scores have been injured, about 80 people are in critical condition, after a series of coordinated terror attacks late Friday at six separate sites in Paris, including a football stadium, several restaurants and a concert/events hall. The jihadists of ISIS have claimed that this was their work. 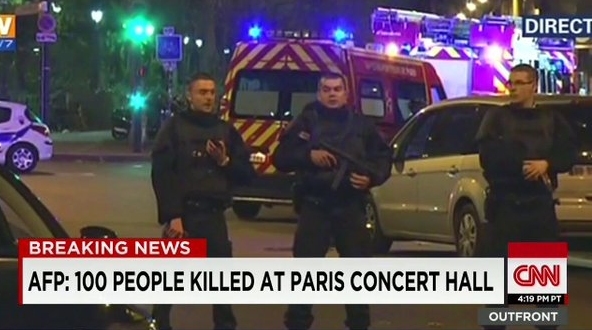 First reports of multiple shootings and explosions in Paris. At the Stade de France stadium, about 80,000 spectators, including French President François Hollande and the German foreign minister Frank-Walter Steinmeier, are watching the French soccer team play Germany in a non-competition match. Three explosions shake the stadium at 9.17 pm local time, 9.30 pm and 9.53 pm. Two of them are at the entrances; one is just outside a McDonalds fast-food shop. Police tell everyone to move out of the stands and onto the pitch and await further instructions. One person was killed in the blast. There are three human bombs. They die in the explosions. Eagles of Death Metal, a music group on tour from the US, are performing to a sell-out crowd of about 1,500 at the Bataclan concert hall in the 11th Arrondissement. Gunfire directed at people sitting in the audience kills several starting at 9:50 pm while the gunmen shriek "Allahu Akbar". (FRANCE 24 translates this as "God is great". In fact, it means "God is greater", which means something significantly different. The Guardian report renders it as "God is greatest".) The four shooters are wearing black and firing AK-47s. All are young - under 25. The Guardian says they "fire calmly, repeatedly and randomly into the densely packed audience. It is dark. The venue is filled with screams. The shooters reload three to four times". The gunmen take about 20 hostages and a stand-off starts as people try to flee the building by every possible means. The Guardian quotes one of many social media messages evidently emerging from inside: "I’m heavily wounded. Please police you have to launch an assault, there are still people alive here but they are killing them one by one.” Around midnight, French special forces storm the building. Three of the gunman die by their own hand, possibly with the help of explosive belts. The fourth is shot dead. By dawn, reports say the death toll is a horrific 87. Reports come in of a series of murderous attacks on people in restaurants. Just outside La Belle Equipe, a restaurant at the corner of Rue de Charonne and rue Faidherbe a gunman is seen emerging from a car holding a high calibre weapon that he begins to fire ("calmly" says The Guardian) at patrons sitting outside on the terrace. The shootings lasted about 3 minutes and the gunman got back into his car and left.” The death toll: 19 people. Two restaurants - Le Carillon bar and restaurant; and le Petit Camboge, both on Rue Alibert, close to Place de la République - come under attack at about the same time as the other assaults. One eye-witness (here) says there are two assailants driving cars with Belgian license plates, young, perhaps late teens or 20. Fourteen are left dead. Many more are seriously injured. Casa Nostra, Rue de la Fontaine-au-Roi, close to the landmark Place de la République in the 11th Arrondissement, Gunman in black, with a heavy weapon, opens fire on people seated on the terrace of the popular pizzeria, while standing in a shooting position: right leg forward, left leg back. Eyewitness: Gunmen appears calm, does not utter a word, swivels, shoots through a car driver’s window before walking into the cafe. More shots, then quiet. Police arrive and find five people have been murdered. The gunman escapes. French President François Hollande arrives at the Interior Ministry to "monitor the situation". Several Paris metro stations are shut down on police instructions. 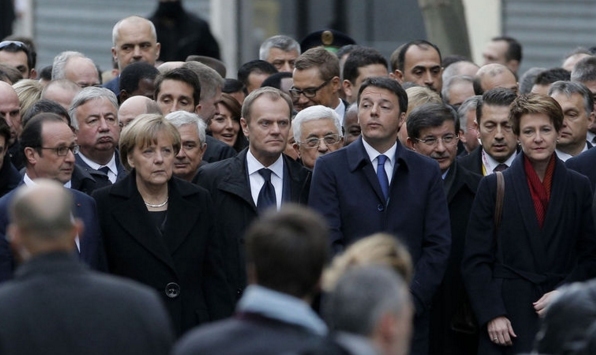 Death toll announced as "at least 35"
President Barack Obama condemns the attacks as an "attack on all of humanity". Paris hospitals go into emergency mode. Hollande declares a state of emergency and announces the closure of France's borders. A few minutes later, police storm the Bataclan with the horrifying results we mentioned above. Hollande visits the Bataclan; vows to lead a "merciless" fight against terrorists. Additional 1,500 French soldiers are immediately deployed to Paris. Death toll is raised to "at least 120". Cancellation of numerous sporting events is announced, along with closing of numerous public facilities, schools, markets, museums, tourist sites in Paris area. Security checks (according to The Guardian) are immediately stepped up in several European capitals. ISIS (which large parts of the mainstream media are still calling a "militant group" today) claims responsibility for the attacks. We have now become the Islamic State’s enemy number one... France is the principal target for an army of terrorists of unlimited means. Furthermore it’s also clear that we are particularly vulnerable because of our geographical position, for the ease of entrance on to our territory for jihadists of European origin... Our darkest days are ahead of us. The real war that ISIS intends to wage on our soil has not yet begun.